SWISS and Air Canada are having a battle with KLM over flight prices from from Vancouver to Dar Es Salaam, Tanzania. SWISS and Air Canada = $973 to $999 CAD roundtrip including taxes. 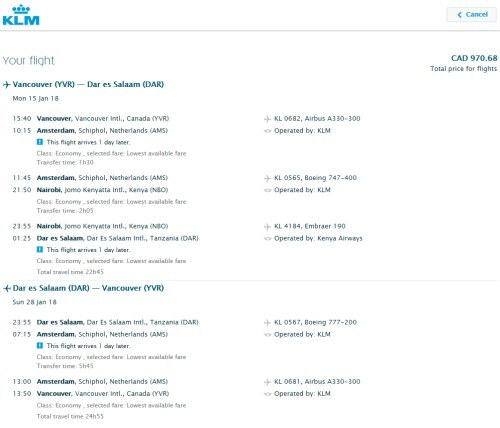 KLM = $970 CAD roundtrip including taxes. This is about 40% below the typical best roundtrip prices from Vancouver to Dar Es Salaam. Dar Es Salaam is the gateway to Zanzibar. 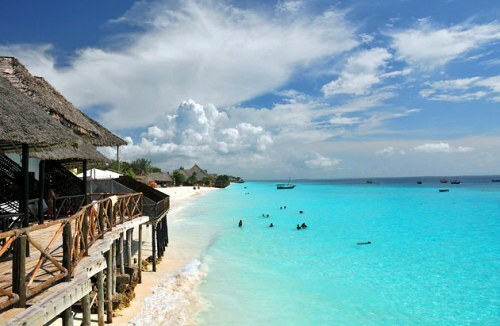 It costs about $35 to $50 USD to take the ferry from Dar Es Salaam to gorgeous Zanzibar (shown in the photo above). On KLM, you can turn this into a '2-continents-in-1' trip, for about $15 more. 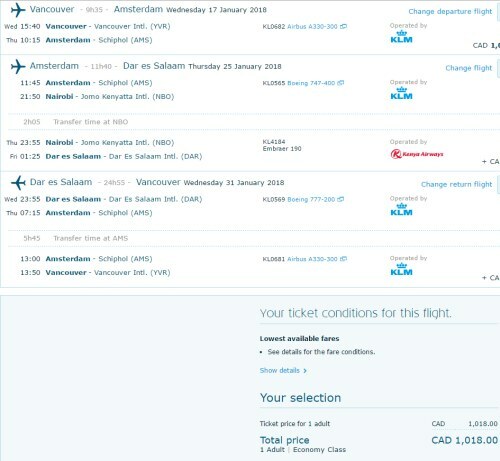 Fly from Vancouver to Amsterdam (non-stop), spend time in Europe, then fly from Amsterdam to Tanzania, spend time there, and fly back home to Vancouver - all for just $1015 CAD including taxes for all 3 flights. Instructions on how to do this are in the blog post below. You should be able to find quite a few other date combinations in October/November if you focus on Mon/Tue/Wed dates. When you get to Momondo, you may want to try clicking on 'Cheapest' and 'Best'. The 'Best' flights may be significantly faster for not much more than the cheapest flights. Update 2/27 - KLM is now showing fares in January and February 2018 from Vancouver to Dar Es Salaam, Tanzania for $1003 CAD roundtrip including taxes. NOTE: I've noticed that sometimes searching for these fares on the KLM website directly doesn't seem to work. It gives you an error message: 'Unfortunately no available flight(s) found.' and doesn't allow you to proceed. But, oddly, if you put the same dates into the Kayak search engine and then click through to the KLM website, they show up. You still get the error message, but the fare shows up below it and you're able to click through and book it. On KLM, you can turn these into a '2-continents-in-1' trip, for about $15 more. 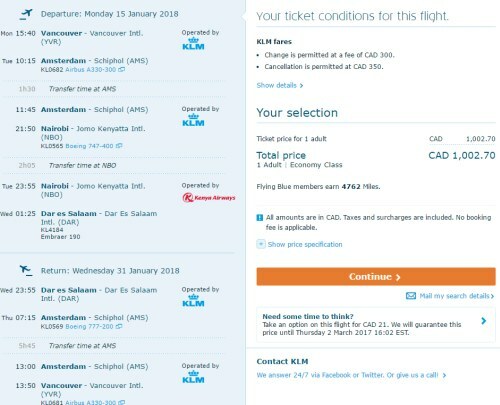 Fly from Vancouver to Amsterdam (non-stop), spend time in Europe, then fly from Amsterdam to Tanzania, spend time there, and fly back home to Vancouver - all for just $1018 CAD including taxes for all 3 flights. As for dates to use, try using start and end dates from the list in the section above this one. You can play around with the middle date to give you more or less time in Amsterdam or Tanzania. Update 3/7 - The KLM flights from Vancouver to Dar Es Salaam, Tanzania have dropped further in price. They are now $970 CAD roundtrip including taxes. Update 5/10 - These are back again today. You can find flights from Vancouver to Dar Es Salaam, Tanzania with KLM for $965 CAD roundtrip including taxes. There are now dates available as far away as March 2018. NOTE: After your search completes on Momondo, you may want to click on 'Best' - this should filter it down to the KLM flights. Although sometimes you need to click on 'Cheapest'. The travel times should look like the screenshot below. vancouver, yvr, flight deals, air canada, africa, swiss, east africa, tanzania, dar es salaam and dar.